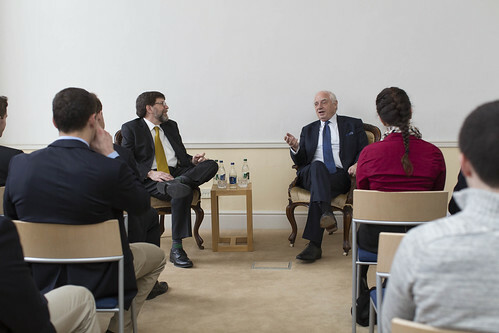 On March 16, 2015, Peter Sutherland, Special Representative of the Secretary General of the United Nations for Migration and President of the International Catholic Migration Commission, engaged in a far-ranging discussion with Notre Dame undergraduates at Notre Dame’s O’Connell House in Dublin and delivered the inaugural Barrett Family Lecture, organized by the Nanovic Institute for European Studies, to a distinguished audience of diplomats, government officials, university leaders, the Irish press, and friends of Notre Dame. After a welcome by A. James McAdams, William M. Scholl Professor of International Affairs and Director of the Nanovic Institute, Mr. Sutherland argued in favor of European political union as a noble and peaceful project of solidarity that stands in opposition to narrowly-conceived nationalist movements. He also remarked pointedly that traditional Irish ideas about neutrality “may have inhibited real debate here on the responses to current perceived external threats to Member States.” The lecture and tenor of Mr. Sutherland’s remarks were reported the following day in The Irish Times. The event was held at The Merrion Hotel, across the street from the Department of the Taoiseach. In attendance at the evening lecture and dinner were several ambassadors to Ireland, the Archbishop of Dublin, officials from executive and judicial departments of the Irish government, business leaders, university leaders, friends, and journalists. Also attending were distinguished guests of the Nanovic Institute, who had previously lectured at Notre Dame: Archbishop Charles J. Brown, Apostolic Nuncio to the Republic of Ireland, Hanna Suchocka, former Prime Minister of the Republic of Poland, and Pat Cox, former president of the European Parliament. Stephen R. and Ruth Barrett were present with their family. Beginning in 2015, the Barrett Family Lecture is designed to bring distinguished speakers to the University of Notre Dame’s Global Gateways in Dublin and London. Made possible by the generosity of R. Stephen and Ruth Barrett, the lecture series elevates the Nanovic Institute’s international profile by creating new opportunities for influential groups of professionals, alumni, and students in London and Dublin to explore the ideas, cultures, beliefs, and institutions that shape Europe today.